One of the most important items you don’t want to forget is a good knife. You’ll want to bring a knife that will stay sharp for a long time and is strong enough to take some abuse. 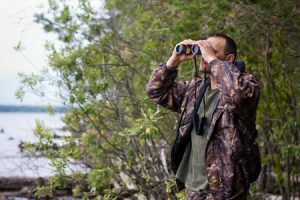 If you look through a set of good binoculars, you’ll be reminded just how cool the outdoor world really is as you see through a different perspective. You’ll be able to see animals in action when they don’t even know you’re around and you’ll be able to change your approach based on what you see. You won’t want to be cold and wet while hunting, so you’ll want to invest in waterproof gear with hunter comfort in mind so you can stay out in the field longer. Just be sure not to wear cotton since cotton absorbs moisture. Staying out longer means you’re more likely to see more game and will therefore have higher success rates, right? Instead of guessing how far a moose is from you, use your rangefinder so you don’t overestimate or underestimate! Now that you are all packed, contact us by calling 1-800-411-0334 with any last questions you may have! We know you’ll love your moose hunting adventure!